Gardening is about seasons, with each one making you appreciate the next, and early spring offers one of the best transitions of the year. The air begins to warm, tiny green buds begin to swell, and the early spring bloomers pop out in a sudden spark of color against the still bare branches. If you’re like me, and winter wears on a little long for your taste, be sure that your garden includes some plants that bloom early, so you can get the earliest start on spring. Here are ten popular favorite flowering trees, shrubs, and plants for the early spring garden. Bridal wreath (Spiraea prunifolia ‘Plena’) is a deciduous shrub with delicate arching branches that erupt in spring in a tangle of tiny white blossoms. Easy to grow and to divide and propagate, bridal wreath is a common sight in old and new gardens alike. Bridal wreath flowers best after a winter chill, just when we need it most. Camellia japonicas are my winter savior! These large evergreen shrubs begin blooming during the dead of winter, often peeking out from beneath the snow cover. By early spring they’re covered with beautiful rose-like blooms that last until hot weather. 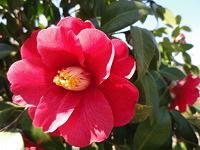 Camellias like acidic soil and a little bit of partial shade. Daffodils, hyacinths, crocus, and other spring bulbs offer some of the earliest color of the season, poking up through the late winter snow to lend assurance that cold weather won’t last forever. Spring bulbs are perfect for naturalizing under trees or even in your lawn, where they’ll brighten up the dormant landscape well before mowing season. Flowering quince (Chaenomeles speciosa) spends most of its year flying under the radar as a rather nondescript, tangled deciduous shrub. 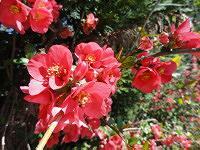 But in early spring, flowering quince earns its keep by exploding in gorgeous blossoms that can be seen for blocks. Flowering quince is one of my favorite branches for forcing indoors. Forsythia (Forsythia sp.) is one of the first shrubs to bloom in spring, and its brilliant yellow color is hard to miss against the bare branches. 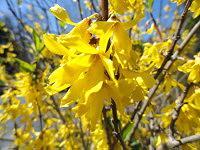 Growing in full sun to partial shade, forsythia is a popular choice for borders and deciduous hedges. Weeping varieties can be planted to trail down slopes or retaining walls. There are several varieties of Japanese flowering cherry trees (Prunus hybrids), including the ‘Yoshino’ of Washington, DC, fame. 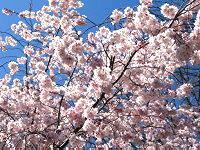 Grown for their blossoms rather than fruit, these cherry trees are cultivated for spectacular beauty. They grow very quickly in a pleasing rounded umbrella shape to about 20 feet tall. Lenten roses (Helleborus orientalis) live up to their name, quietly blooming just in time for the Lenten season in early spring. While not the most eye-catching perennial in the garden, Lenten roses go the subtle route, with gorgeous long lasting flowers that nod their heads and invite you to take a peek. 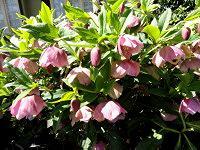 Lenten roses do well in shady gardens. 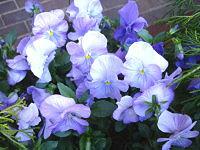 One of the few cool-weather annuals, pansies and violas offer a gorgeous array of colors for the early spring garden. 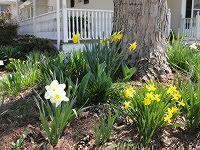 They tolerate light frost and will bloom until hot weather kicks in. Whether you’re filling dormant flower beds or porch containers, be sure to include some of these cheerful flowers in your plan. Colder zones can plant in early spring. A saucer magnolia (Magnolia x soulangeana) in full bloom will just about knock your socks off! This smallish tree begins setting buds in the fall, to emerge in full bloom in early spring before the foliage grows. 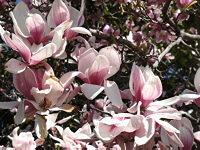 The waxy magnolia blossoms literally drip from the branches and provide a lovely carpet of petals. Grows in full sun but enjoys a little afternoon shade. 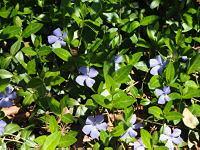 Vinca is a wonderful evergreen groundcover that blooms in spring with small periwinkle-blue flowers. Vinca major is about a foot tall and very fast-growing; Vinca minor is low-growing and less invasive, and the flowers add color to naturalized areas. Adaptable to shade or full sun, it’s a great plant to tie different garden areas together. We’re based in Mobile, Alabama, so for the best answer, we’d suggest contacting your local Master Gardeners association. I live in western Kentucky. 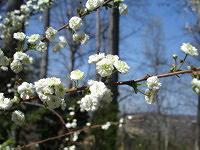 In early spring,a tree with white flowers blooms before the dogwoods. This is in the woods. Can you offer any suggestions of what it might be? what is the best way to maximise display of container shrubs?